St. Cecilia's Abbey in Ryde have had their website redone. There is information about the life and work of the Abbey with photos from the cloister and the garden which are within the enclosure, to which visitors and guests do not have access. At the Chapter House tab, you will be able to read the fine addresses of Mother Abbess. Although the website has changed, the sister who wrote to me said that the life of the community has not markedly changed since the old website first went live in 2000. I was glad to hear that. For many years, St Cecilia's has bucked the downward trend in religious vocations. Currently they have a novice and two juniors in their twenties. If girls don't know Latin when they enter - and they usually don't know any - they learn it in the novitiate. It is astonishing how quickly you pick it up with one-to-one teaching and singing it in the liturgy several times a day. The same is true of Gregorian Chant. Most of us are not "musical", but our choir mistress says she has found that anyone can learn to sing the Chant. People nowadays often use discipline in posture and breathing as aids to prayer, or learn to discern the promptings of the Spirit through their memory or imagination or emotions. Learning Latin and music for the sake of praying through the Chant is just another discipline which centuries of experience have shown to be a way to deeper union with God. To think that some people are complaining because we will soon have an English translation that is more challenging to read out loud! 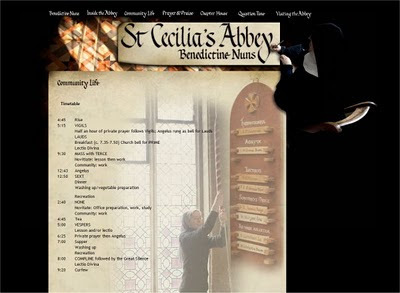 You can buy CDs of the community's Gregorian chant, and the Abbey Scribes website shows some of the calligraphy which has been a part of the work of the nuns for 60 years, and information on how to commission an individual manuscript.